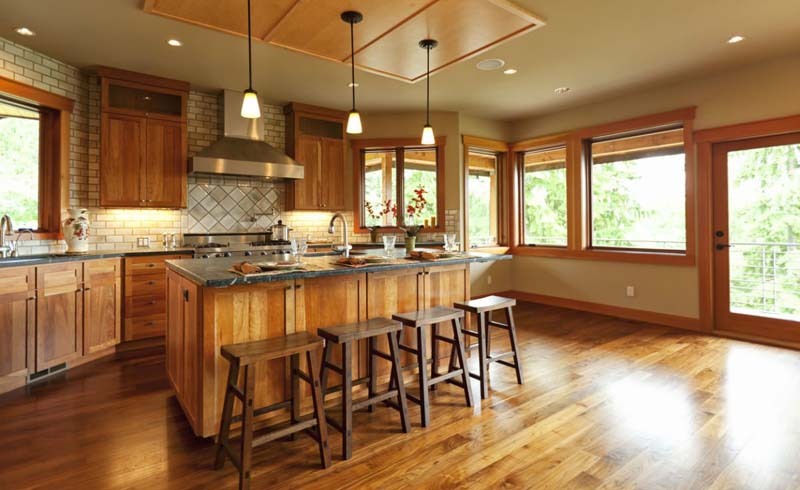 Learn why wood flooring in the kitchen is a growing trend—and the secrets to successful installation and maintenance to keep your wood looking good. It’s hard to beat the natural beauty of wood flooring, but it’s not a traditional choice for a kitchen, due to the greater risk of damage from water and traffic in this room. Yet wood flooring is currently trending in today’s kitchens, so if you’re considering it for your home you’ll want to be informed about species options, installation, and maintenance to reduce the possibility of damage. Learn why wood is trending. In addition to its good looks, wood is becoming popular flooring for the cook space so as to create a visually seamless surface between the kitchen and an adjacent dining room or a great room. Many homeowners preferable this cohesive look to the start-and-stop feel of different flooring in adjacent rooms. Additionally, wood has a warm, soft sensation underfoot, unlike ceramic or porcelain tile, which can be uncomfortably cold on bare feet or on a crawling infant’s knees. Because the kitchen is such a busy, spill-prone area, however, it’s important to consider the potential downsides of wood before installing it in this room. Remember: Wood and water don’t mix. When wood becomes saturated, it can swell, warp, or even split—so even a small dishwasher leak that goes undetected for some time can damage a section of a hardwood floor. A splash here and there, however, especially if it’s wiped up quickly, poses less risk. Consider your family’s habits. If spills are rare and you’re vigilant about the state of your kitchen appliances, a hardwood kitchen floor should hold up just fine—as long as you give it a polyurethane sealant every four to six years to maintain a high level of water resistance. The wood flooring industry uses the Janka Scale to rate the hardness of various types of wood—the higher the rating, the harder the wood. To learn the hardness rating of the wood you’re considering, check out The National Wood Flooring Association’s Janka Scale. Wood with a Janka rating over 1500, such as hickory or Brazilian walnut, will withstand the increased traffic in a kitchen better than a softer type of wood, such as white ash or beech. Whether you enlist a professional contractor or have the skills to put down the floor yourself, the wood must be allowed to acclimate to your home before installation for best results. Most wood flooring is stored boxed in unheated warehouses, where the climate is often quite different from the temperature and humidity of residences. If you install wood flooring before it acclimates, it could swell or shrink slightly and your floor could end up with gaps between the planks. Acclimation involves cross-stacking the boxes of planks in your home for anywhere from one to three weeks, depending on species. Recommended acclimation periods can be found in the manufacturer’s installation and warranty information. Compare prefinished and unfinished planks. The simplest way to install wood flooring is to purchase prefinished planks, which provide a finished floor as soon as they’re nailed down. 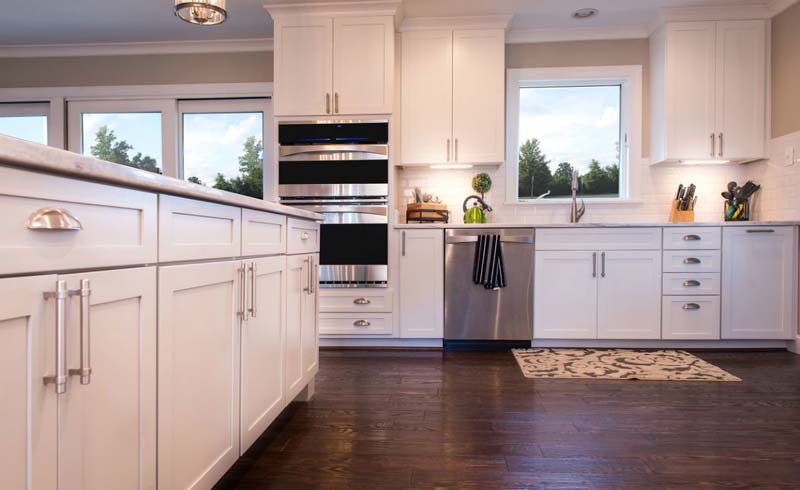 Yet when it comes to kitchens, prefinished flooring is not preferred. Prefinished planks typically have slightly beveled edges that give the floor a finished look, but these bevels create tiny tracks between the boards that allow spills to run down between the planks. Even though it involves additional work, opt for unfinished planks, which are completely flat, for your kitchen. After the planks are installed, the entire surface should be sanded, stained, and then sealed. This offers a uniformly smooth surface, seals the gaps between the boards, and protects the flooring better against spills. Seal and restore your floor. A good sealant makes the difference between a wood floor that withstands traffic and spills in a kitchen, and a floor that’s easily damaged by water spots and scratches. Both water-based and oil-based sealants are available, but for kitchen use, a quality oil-based sealant, such as Varathane’s Clear Matte Oil-Based Polyurethane, will provide the greatest protection. The downside to applying an oil-based sealant is the longer drying times, some requiring up to 24 hours before you can walk on the floor. Whether you choose to put in a new wood floor in your kitchen, or you’ve moved into a house where it’s already installed, the following care and maintenance tips will help you keep it looking good. Use a soft cotton dust mop to clean away crumbs and pet dander. If you prefer to sweep, use a broom with soft rubber bristles that won’t scratch the floor’s finish, such as LandHope’s Non-Scratch Broom. Don’t use a steam floor cleaner, which could damage the finish. Put soft furniture pads on the bottoms of kitchen tables and chairs to keep them from scratching or denting the wood floor. Check frequently under the sink and around the dishwasher and fridge for signs of leaking. If you discover a leak, shut off the water to the kitchen and call a plumber. Use rugs and floor mats liberally to protect the wood flooring in high traffic areas. Rugs will also absorb small spills before they can reach the flooring. If you must move the dishwasher, stove or fridge, place a sheet of thin plywood on the floor and slide the appliance onto the plywood instead of sliding it across the wood floor.